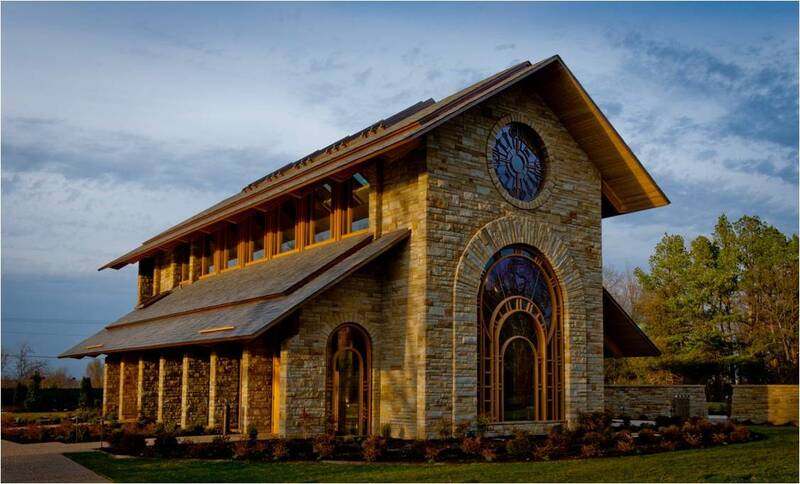 The chapel seats up to 135 people for funeral and wedding services. It is 3,000 square feet and the height at the ridge is 43 feet above the ground. The stone in the arches and walls comes from local quarries in Northwest Arkansas as well as Eastern Oklahoma. The stone of the chapel speaks to the chapel’s permanence and strength. The wood, protected by the slate roof, shows depth and life though its grain. One first enters the Narthex of the chapel and continues into the Nave. The Narthex provides compression while the Nave opens up and allows for focused views to the south and open views to the periphery. During the day, the chapel is illuminated by natural light, requiring very little artificial light.